The Clinical Microcurrent Stimulator provides all the capability of formal clinical microcurrent machines: ability to adjust current levels, polarity, and frequency. 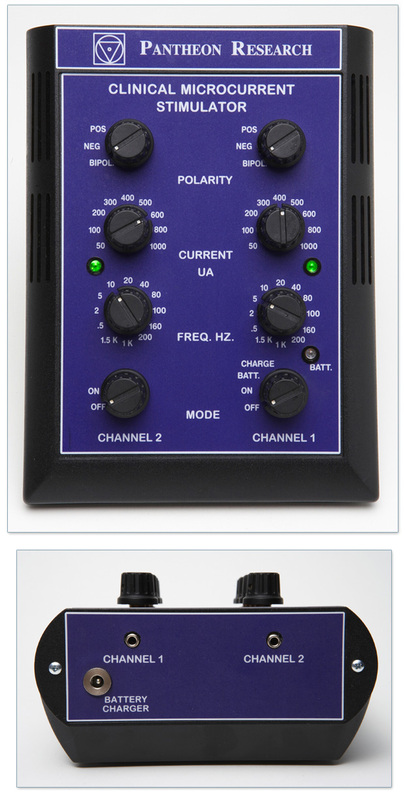 Two separate output channels, facial skin probes and TENS pads capable. Rechargeable battery, very portable, inexpensive pricing. Not appropriate for electroacupuncture using needle stimulation. Purchase a Clinical Microcurrent and receive a complimentary 12 CEU Distance Course on using Microcurrent for Facial Rejuvenation. That's a $149.99 Value! Microcurrent therapy uses extremely low-level electrical currents (microcurrents) to treat nerve and muscle pain, inflammation and other health challenges. When you undergo microcurrent therapy, you sit comfortably while electrodes are placed at strategic locations to direct the currents to the targeted tissues. Warm, moist towels are applied to facilitate conduction. Unlike the more familiar TENS units, which also use electrical currents to relieve pain, microcurrents are so weak that they don’t stimulate the sensory nerves, so you feel no shock-like sensations. A treatment course typically involves several sessions, and benefits accrue over time. Microcurrent therapy is safe and has no significant adverse effects. However, it is not recommended for patients who have pacemakers or are pregnant. I just used the microcurrent machine on a strained muscle on my own foot. The muscle is much better after only two treatments. However I was promised a manual for the machine but have not received it.